Paved shoulders provide additional recovery space for errant vehicles and lateral support for the pavement structure. A study by Center for Transportation Research and Education (CTRE) (Hallmark et al. 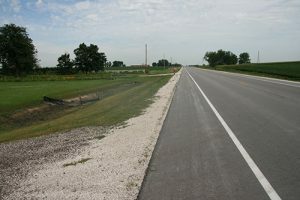 2010) evaluated the effectiveness of adding paved shoulders on non-Interstate roadways in Iowa. Data were collected and evaluated before and after installation of paved shoulders (143 roadway sections). Data were also collected at control sections (77 roadway sections). A decrease of 8% per year in total crashes is expected with addition of paved shoulders. A decrease of 1.3% in ROR crashes per year is expected with addition of paved shoulders. 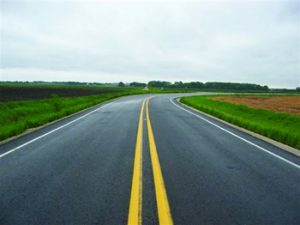 A survey of law enforcement officials indicate they overwhelmingly believe that paved shoulders reduce the incidence of ROR crashes and improve safety on Iowa’s roadways. Zegeer et al. (1981) report that widening the shoulders on a rural two-lane roadway from 1.6 to 8.2 feet reduced run-off-road and opposite-direction crashes by 16 percent. More information is provided in this technical brief, Paved Shoulders (PDF), which summarizes information about paved shoulders. Additional information is provided in Chapter 1 of Lane-Departure Safety Countermeasures: Strategic Action Plan for the Iowa Department of Transportation (PDF) (Nambisan and Hallmark 2011). Hallmark, S., T. McDonald, Y. Tian, and D. Andersen. Safety Benefits of Paved Shoulders. Center for Transportation Research and Education, 2010. 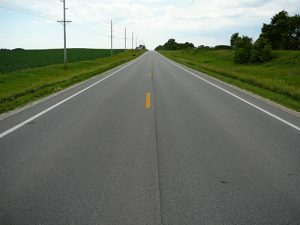 Partial shoulders throughout curve on rural Iowa highway (Bob Sperry/Iowa Local Technical Assistance Program).